We're in the last stretch of the All-Out War, but what's next? With The Walking Dead coming back from its midseason break this Sunday, we've got a lot to look forward to in the remaining 8 episodes of the season. Most notably, we are racing to the finish line of the All-Out War arc, but once the battle with the Saviors has reached its conclusion, where do we head from there? This article will contain some spoilers, so don't read on unless you want a little bit of a tease about what to expect. We won't give away any of the significant plot details, but we are going to talk about some rumors of what's ahead to shed some light on the next group we might be dealing with. We know that the Whisperers are coming, but how exactly are they going to fit into the show's timeline? Well, season 8 is pulling a few major changes with a little misdirection mixed in. Carl's impending death is a big clue that the plot on the show will play out a little differently from the source material. In terms of misdirection, early this season we were treated with a number of small time jumps and even a future sequence of a grey-bearded Rick, but that scene included Carl, which means the scene was likely a dream sequence and not a glimpse at the future. There's a little bit of a tease for comic readers there, because the conclusion of All-Out War jump us forward a couple of years. One question we have is how long the time jump will be on the show's timeline. We know that the creative minds behind the show have a plan for what The Walking Dead looks like without Carl, so one theory is that we may skip ahead a little longer to propel Judith into a situation where she can develop into a more prominent character, sort of as a narrative replacement following the exit of Chandler Riggs. 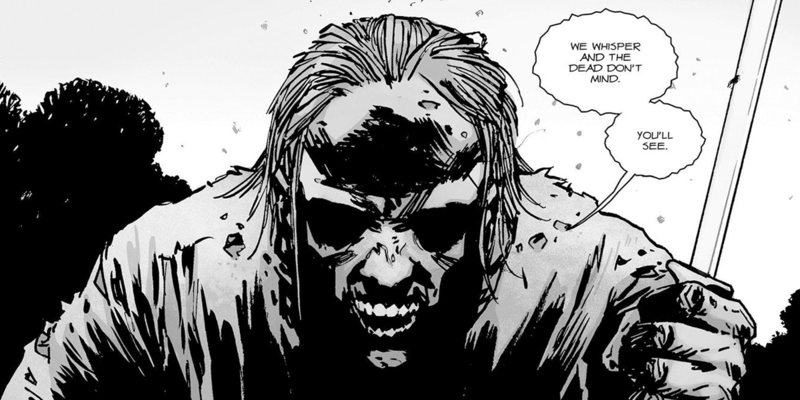 Either way, the end of the season is heading towards that time jump, which might include a tease of the Whisperers, likely the next villainous group on the agenda once the war with the Saviors is behind us. So the Whisperers... clean the skin of the dead, zombie or otherwise. It's essentially human leather at that point. They were seen stretching it out and drying it in recent issues. The skin is processed. It masks their smell, and makes them smell a little dead, which allows them to move among the dead, but the inside of it... very clean and safe. I hope that clears things up. The ability for a large group of antagonists to effectively be able to ignore the walkers does change the game a bit. Frequently, we've seen our group of survivors utilize herds and walkers in creative ways to win their battles or get out of precarious situations. They are typically a persistent danger as well, but in the coming arc, they are less dangerous to the enemy by virtue of their ability to blend in. This should be pretty different from our previous villains on the show. The new dynamic of this and the upcoming time jump might be the refreshing change of pace we need going into the 9th season of this show. In the meantime, we have a war to finish before we get there. Whether these 8 episodes end with a tease of the Whisperers is still up in the air, but it's certainly possible that viewers will get their first look at this group to set the stage for next season. Are you intrigued by the thought of how AMC might adapt this group for the show? Share your thoughts with us in the comments below.